For once! I can say I was way to young to remember the gingham connection. I do know she was a “pin up” beauty and a real beauty with no implants / facial adjustments. Had a “they” (make up artists/designers ) was absolutely a perfect size / fabulous figure. Thank you for the gingham connection – often wondered where / who made it a fashion statement in the Fab 50’s. First congratulations on a terrific find!! This is, indeed, special and noteworthy for your many readers. Now, here’s my ‘ask’. Would you consider selling it in a while? We have chatted over the years about antique and vintage brassieres. I have been working on an extensive international collection for some 7 years. It now includes some very rare items. 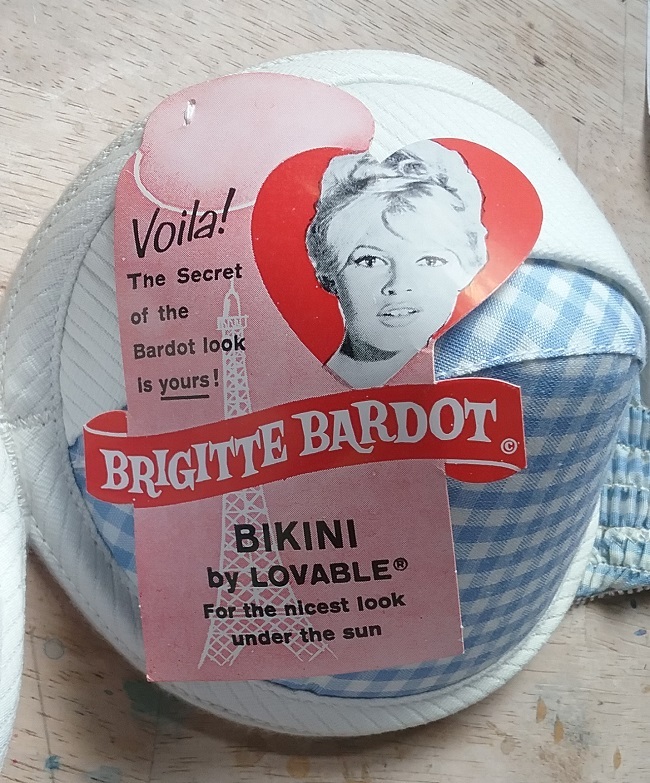 I think your Bardot bra would be a terrific example of ‘movie’ + marketing + garment combination. 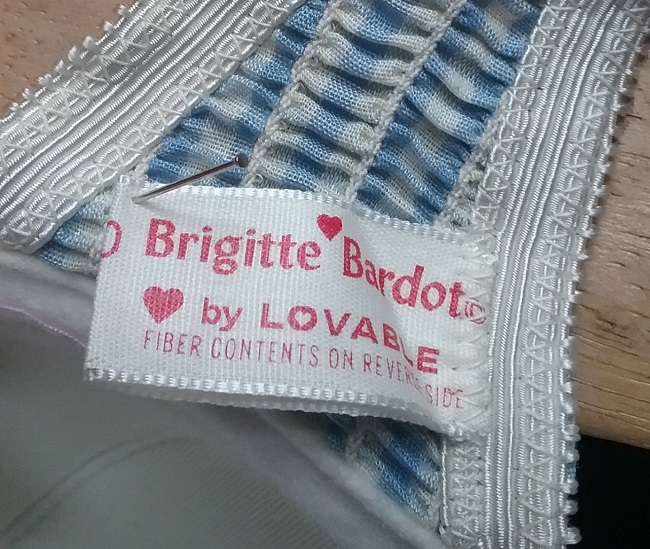 I already have a Loveable BB bra, but its not this gingham one, and especially not the all important advertising tags. If you have a price, I’d like to discuss. Even if you can please give me first right of refusal, that’d be wonderful! I am currently in contract negotiations to loan a significant part of my collection to the San Angelo Museum of Fine Arts for their “Inside-Out” exhibit which runs September 20 to January 20, with an option to tour the USA for 18 months after that. The museum had heard about my collection from a New York contact we had in common. Their curator came up to Canada to see my collection in March, and returned with great excitment. They came to me when the Smithsonian and F.I.T. could not accommodate their request. My collections dates back to late 1890s, extends around the world, but primarily North America and Europe. My bible is UPLIFT: The bra in America. This is the link.. There will be a hard cover catalogue and I’ve been invited to contribute an essay on my collection. http://www.samfa.org/inside-out-exhibit. As always, I love your blogs!! You are a terrific ambassador for vintage artifacts, fun facts, wonderful links, and a philosophy that your readers just love. Thank you for being such an inspiration and resource to us all. John, first thank you for the very kind words. I’ve got good news for you. The seller of this bra, Ballyhoo Vintage has more than one of them. The last time I looked they had not yet posted them for sale on their site, but you might keep an eye out as they will be for sale. I’m wondering just who could fit into those bra cups? Aren’t they oddly shaped and close together? They are. 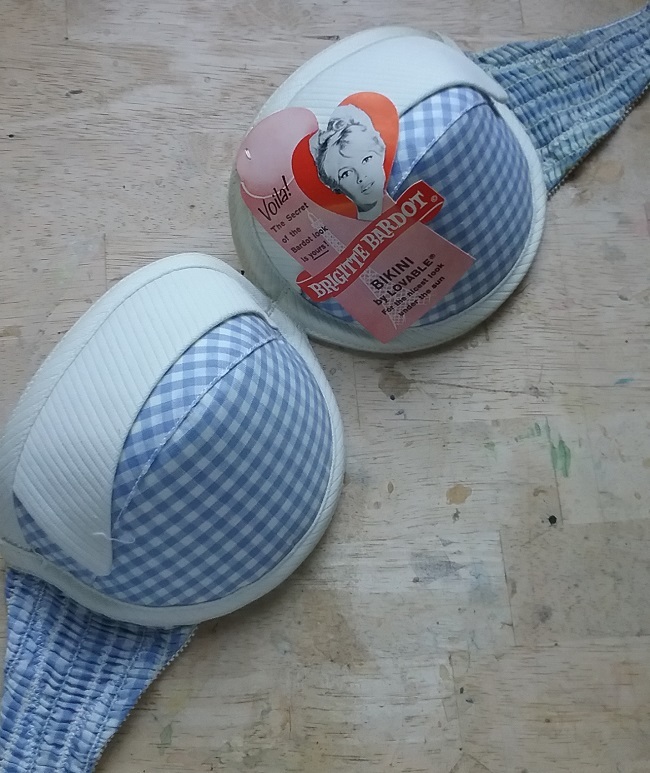 This was made for a very small girl, I think the size is a 30, but there’s no cup size. The cups are very rigid, and probably were meant to enhance a teen’s natural charms, so to speak. Lovable was an interesting company, with a story you don’t often hear of, especially in the South. Wow! That is such a find! The original paper tag with her picture on it is all too perfect!